This electronic wind vane represents the latest technology in wind sensing: a balanced wind direction vane with a near-zero friction bearing and a high accuracy magnetic angle sensor to provide precision wind direction. Unique locking feature allows you to easily set "North" regardless of mounting orientation (see below). Input 2.7-5.5VDC; output: 5% to 95% of the input voltage, proportional to angular position. NOTE: The e-Vane2 does not include any electronics or display. It is fully compatible with the Inspeed WindWorks electronics platform. The active element is a Hall effect sensor. Wind direction is provided by a magnet attached to the vane, and which hovers over the sensor. The E-Vane requires an input of 5 VDC and provides an analog output of 5% to 95% of the input voltage. Zero dead band. Many potentiometer wind vanes have a dead spot of several degrees. This device has no dead band. Near-zero friction. Since the magnet is not in contact with the Hall sensor, there is no friction from the sensor. Virtually infinite life. Unlike potentiometers that wear out, the magnetic Hall sensor is non-contacting and should theoretically last forever. The E-Vane requires 2.7-5.5 volts DC for power. It has three wires: ground, power, and signal. CAUTION: some power supplies - even regulated - can generate spikes that will destroy the Hall sensor. Make sure your power supply (if you provide your own) does not produce spikes - especially when plugging/unplugging them. The Inspeed e-Vane includes a unique locking feature so you can twist the vane and set "North" (or zero output) to wherever you wish. That means that the offset bracket can be pointed in any direction you want, unlike other manufacturers that force you to point the bracket to North so it will read correctly. 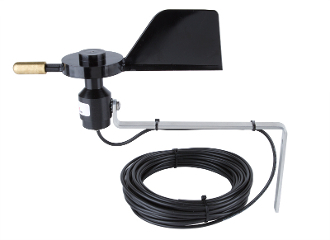 WIth the e-Vane, just mount the vane, lock the sensor when the software (or your device) says North, twist the vane until it points North, then release the sensor so it is free to rotate. Simple! Click here for more information and instructions!